Originally expected in 2016, the second test launch of the Angara-A5 rocket was to carry the vehicle's first operational payload. However manufacturing problems delayed the mission for several years. Angara-A5 rocket with Briz-M upper stage. Even before the first Angara-5 rocket embarked on its maiden test mission in December 2014, the PO Polyot company in the Siberian town of Omsk was busy working on the second and third vehicles. During 2014, PO Polyot manufactured the propellant tanks and other structural components of Vehicle No. 71752 intended for the second launch and also started outfitting key sections of the rocket. In parallel, the company's Division No. 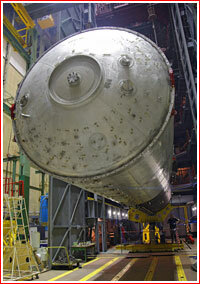 67 was welding the bulkheads of propellant tanks for the third rocket (Vehicle No. 71753), while Division No. 14 was manufacturing flanges. Similar work on Vehicle No. 71754 was planned for 2015. Due to delays with the production of some parts at PO Polyot itself and others to be delivered from subcontractors, in particular from KB Armatura, the overall progress was under great pressure. (726) As of the beginning of 2015, the second rocket was expected to leave the assembly line by November. (725) However, by mid 2016, the rocket was yet to be completed with its launch slipping to the middle of 2017. In mid-2014, the first deputy to Roskosmos head Aleksandr Ivanov told the Ekho Moskvy radio station that Angara-5 vehicles had already been ordered for launches of operational satellites scheduled in 2016 or 2017. In an interview with the ITAR-TASS news agency in August 2014, the head of GKNPTs Khrunichev Vladimir Nesterov said that during its second mission, Angara-5 would be carrying an operational payload, even though the launch vehicle would officially remain in flight testing phase until 2020. As was the case with the first launch, GKNPTs Khrunichev's marketing arm, International Launch Services, ILS, was expected to "sell" available payload onboard the rocket to a customer outside Russia at a discounted rate, given the risk involved. However these plans were apparently dropped as the second mission's launch schedule became uncertain. By 2015, plans were made for the new rocket's second mission to launch the Angara-5/Block DM-03 variant carrying the Angosat communications satellite, which was previously slated for delivery by a Zenit rocket from the Sea Launch platform. 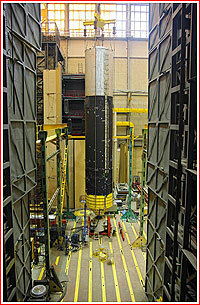 Both, Block DM-03 and Angosat, were being developed at RKK Energia in Korolev near Moscow. Once again, this plan also had to be abandoned in the face of new production delays at the manufacturing plant in Omsk. During the Moscow Air and Space Show, MAKS-2017, the newly appointed head of GKNPTs Khrunichev Aleksei Varochko promised that the second Angara-5 rocket would be shipped from its manufacturing plant in Omsk to Moscow on July 25, 2017. 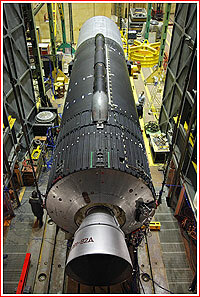 Varochko's statement quoted by the Interfax news agency appeared to indicate that one of the five URM-1 modules comprising Angara-5's first stage would be sent to TsNIIMash for disassembly and testing in order to certify the vehicle's manufacturing line in Omsk for serial production. This assurance was apparently required after the manufacturing problems had been found in the first vehicle produced in Omsk. According to Varochko, the second Angara-5 rocket would then be sent to Plesetsk in February or March 2018. 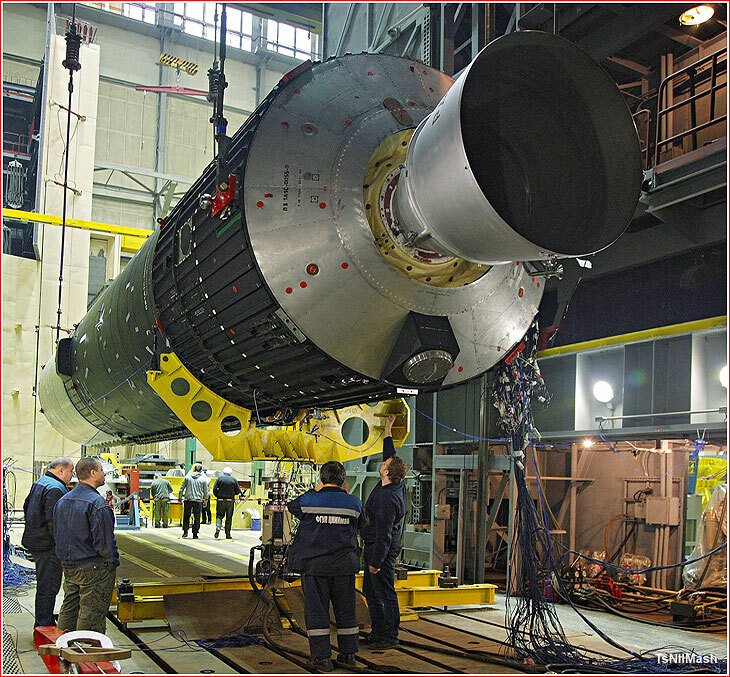 In the meantime, the factory in Omsk was working on the components of the third and fourth Angara rockets, however their final assembly was apparently been held off until the newly established production process could be certified as sound. However, only on Oct. 6, 2017, Roskosmos State Corporation suddenly announced that the components of the second Angara-5 rocket "had been continuing to arrive" at GKNPTs Khrunichev in Moscow. According to Roskosmos, a train which departed the factory in Omsk on October 6 carried the BB-3 side booster for the rocket's first stage and a similar stage intended for dynamic testing in order to confirm the readiness of the manufacturing plant in Omsk for serial production. The state corporation did not specify when other boosters had been or would be dispatched, but said that the final assembly of the second Angara-5 vehicle would be completed at GKNPTs Khrunichev in Moscow and that the rocket would be shipped to the Plesetsk launch site in 2018. A prototype of the URM-1 booster shown at the dynamic test stand in TsNIIMash research institute in Korolev on Nov. 29, 2017. On Jan. 16, 2018, PO Polyot factory in Omsk shipped another pair of URM-1 modules to Moscow, including the BB-1 strap-on booster for the first stage and the core booster, serving as the second stage for the Angara-5 rocket. It was clear from the accompanying press release that BB-2 and BB-4 boosters were yet to be delivered to complete the four-booster first stage. According to Roskosmos, a prototype of the URM-1 delivered earlier had been undergoing testing at TsNIIMash at the time. The testing began at the end of 2017 and, as of January 24, 2018, the trials at TsNIIMash were expected to last for several more months, Roskosmos said. Photos released at the time showed the apparent arrival of the prototype booster at the dynamic testing facility in TsNIIMash on Nov. 29, 2017, and the same booster in vertical position on Jan. 24, 2018. In an interview with the Izvestiya daily published on January 17, Director General of GKNPTs Khrunichev, Aleksei Varochko said that the second Angara-5 rocket would be delivered to the Ministry of Defense in 2018. 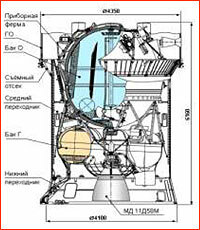 However Varochko did not specify the actual launch date and hinted that the company had still been looking for a commercial customer, which would agree to fly its payload during the second Angara-5 mission. It probably also meant that there was no military or other federal payload assigned to that launch. That fact was confirmed in the August 16 TASS interview with the Head of Roskosmos Dmitry Rogozin who hinted that the Ministry of Defense was yet to determine the payload and the upper stage for the second mission of the Angara-5 rocket, which was now expected in 2019. 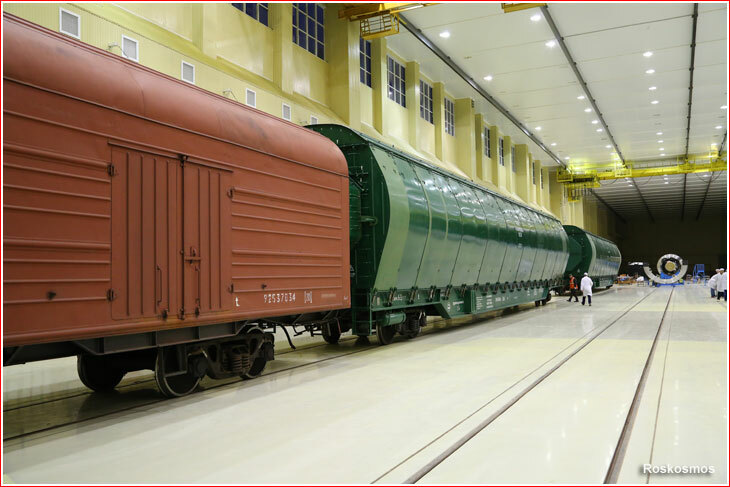 On September 18, 2018, a train, carrying the final URM-1 booster for the second Angara-A5 rocket, departed its production plant in Omsk for Moscow, where the rocket will undergo final assembly and testing, Roskosmos State Corporation said. 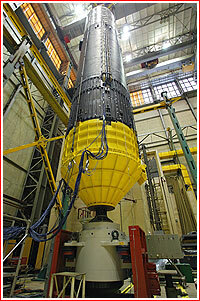 In the meantime, the vibration and strength tests of the URM-1 prototype at the TsNIIMash facility were successfully completed, according to Roskosmos. The State Corporation re-confirmed the scheduled launch of the second Angara-5 vehicle in 2019, but did not specify the exact date or the type of payload for the mission. However, after the expanded management meeting at GKNPTs Khrunichev on Feb. 7, 2019, the company announced that the next launch of the Angara-A5 rocket had been scheduled for December of that year. 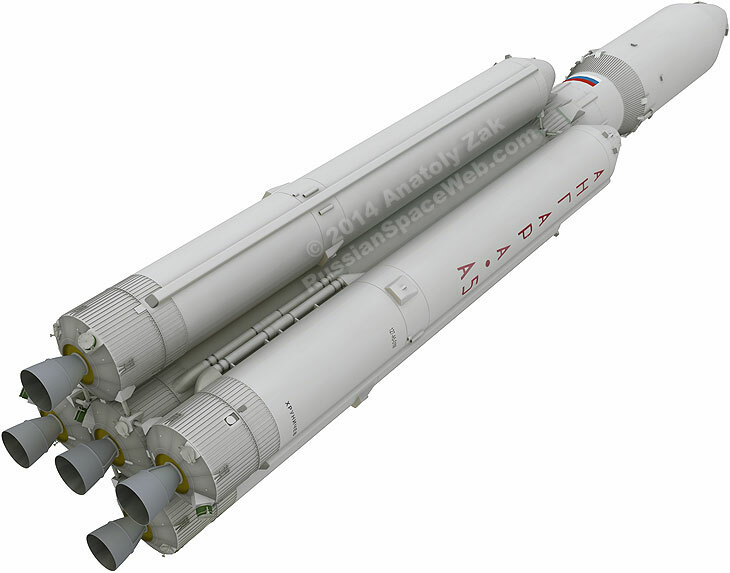 On April 1, 2019, the head of GKNPTs Khrunichev Aleksei Varochko told the official Russian media that the payload for the second Angara-5 launch (still planned before the end of the year) would be selected in August.